Immediately upon getting the news that we were expecting a baby boy the gears started turning in my head fueled by ideas for decorating in a theme and possibilities for color combinations. 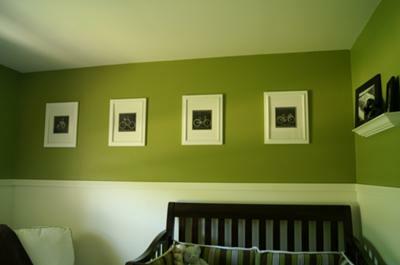 My husband is an avid biker so he wanted to include vintage bicycles as part of the nursery's design. I was hesitant because I thought it would be difficult to find suitable decorations for the walls to use in decorating the baby's room much less a crib set. This was a concern until I realized that making our own baby bedding was an option that might actually save money and that putting wheels on everything in the room was not a necessity. We learned more about what we liked and did not as we felt our way through the process but the one thing that we knew from the very beginning of the project was that we didn't want the traditional pastel colors of blue and green. What we did choose was an olive green, chocolate brown, and white color combination that looks absolutely amazing together. We painted the top third of the walls using a bright olive green paint color. My husband then installed a contemporary wooden chair rail and painted the bottom two-thirds of the walls white to give to appearance of wainscoting without the expense. The bright green walls make my son's eyes light up every time we enter his room. When it came to buy bedding and window treatments the vision that I had in mind included something with stripes and polka dots. 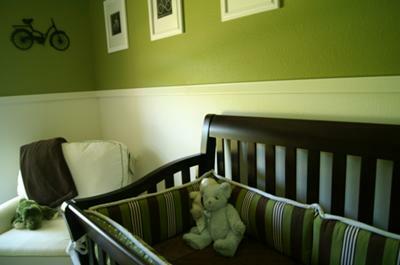 I wanted to add patterns that would bring life to the brown and green nursery. I wanted to bring in a touch of contemporary that would contrast with the vintage bicycle nursery theme. We were having a difficult time finding just what we wanted in any of the stores or online so my talented mother and I hit the fabric stores. We found the striped fabric at LuLu Belle's Fabric. The polka dot fabric is from Hancock Fabric. 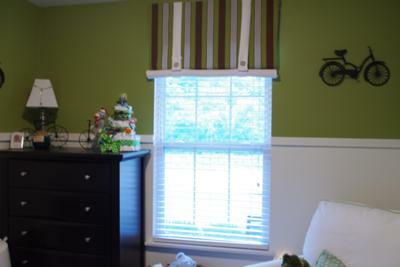 My mother did an amazing job custom designing the baby bedding, the nursery valance and diaper stacker. The vintage bicycle chalk drawings above his bead were found on Etsy. The iron bicycle sculptures were found at Hobby Lobby. Above his changing table is his name using Pottery Barn Kids lowercase letters. 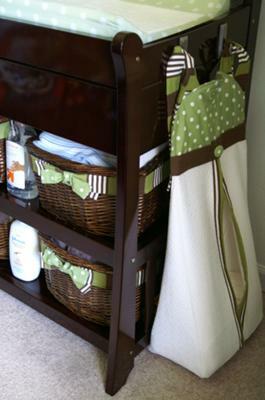 Changing table baskets are from Michaels with custom fabric bands decorating them to complement the nursery's decor. Our baby boy's crib and dresser are from Treasure Rooms and are the Munire Urban collection. The rocking chair is from Treasure Rooms and is from the Best Chair collection. I hope that you have enjoyed the tour of our vintage bicycle nursery theme as much as we enjoyed decorating it! What a delightful room! The decorative modern touches that you added definitely set it apart from other pictures of vintage nurseries! Thanks so much for sharing your resources with parents that visit Unique Baby Gear Ideas. The information that you have shared will help other cycling enthusiasts know exactly where to look to find exactly what they are looking for. You mention that you found the chalkboard artwork on Etsy but I see no mention of the actual vendor or store where you found it. I realize that by now you are most likely very busy with the day to day care of an infant but it would be great and save me a lot of time if you could post the name of the store and the price that you paid for it. I would love to know what brand and specific name of the color..if you don't mind sharing..puleeeze? Where did you get this bedding??? I am looking for green striped bedding just like this one!! Where is it from??? I love it!! Where did you find the bicycle lamp for the room? I'm thinking of doing a similar theme and am having trouble finding a lamp like that. Any help would be greatly appreciated! Lovely!! This is EXACTLY what I want for my baby- brown/green, stripes/polka dots, and vintage bicycle theme that isn't over the top (we cycle as well! Thanks for the inspiration! Great post! Decorating a room for a baby shouldn't be that hard, you just have to focus on what fits your lifestyle. Stay focused on all of the important details, from the wall decorations to the crib sheet set to insure a perfect flow in the nursery. And don't be afraid to ask for certain items for the nursery (like bicycle themed decorations) so that friends shopping for baby gifts can help you decorate!